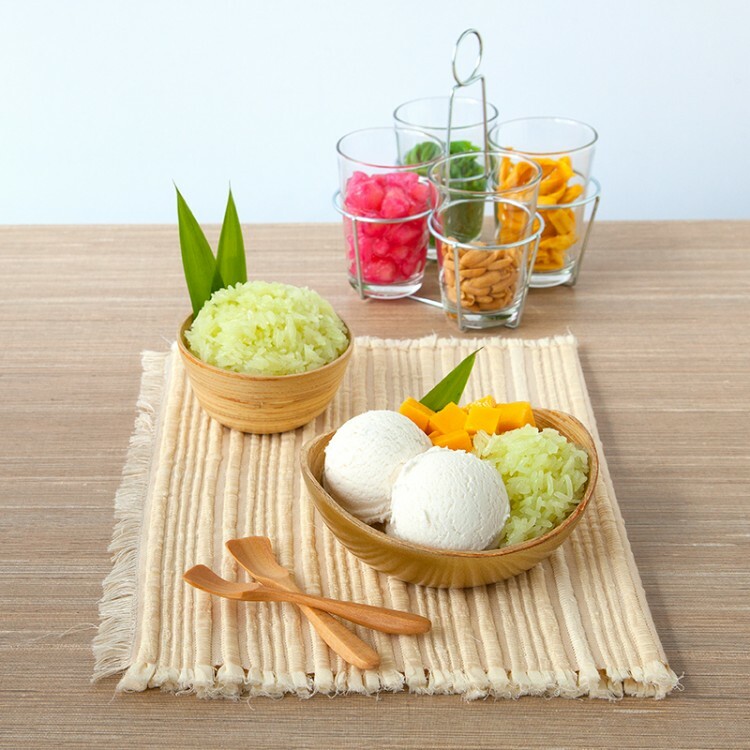 The signature of Thai dessert is coconut Ice-cream. There are variety of toppings to choose from, including sticky rice, sweet corn and peanuts to drizzle on top. 1. Rinse glutinous with water and soak at least 6 hr or overnight. 2. To cook glutinous rice, using steamer, line the perforated tray of the steamer with cheesecloth. Place soaked glutinous rice over the cheesecloth and spread out evenly. Steam for 30-45 min or until al dente. 3. In the meantime, while waiting for the rice to be cooked, clean Pandan leaves and cut into smaller size. Blend coconut milk with Pandan leaves, using blender. Strain the coconut milk. Combine coconut milk, sugar and salt in a saucepan. Bring to a simmer over very low heat. Remove from heat. 4. When the rice is cooked, transfer to a shallow bowl and pour the mixture of coconut milk over steamy glutinous rice. Gently fold the rice with milk and cover immediately. Glutinous rice will absorb all the coconut milk while still hot. Wait until cool down and serve with coconut milk ice cream and condiments such as ripe mango, toasted peanut, jackfruit and tapioca pearl.